‘Neville Playa’ vest, Shorts, and Tribal cord necklace by Marc by Marc Jacobs, Tibetan agate bracelet (worn throughout) by Miracle Icons by Mary Jo Pane, Sterling silver greek cross Necklace and waxed cotton and brass keyring bracelet by Giles & Brother, braided leather ‘My Colors’ bracelet by Tod’s, and 16mm pearl Earrings (worn throughout) by Givenchy. 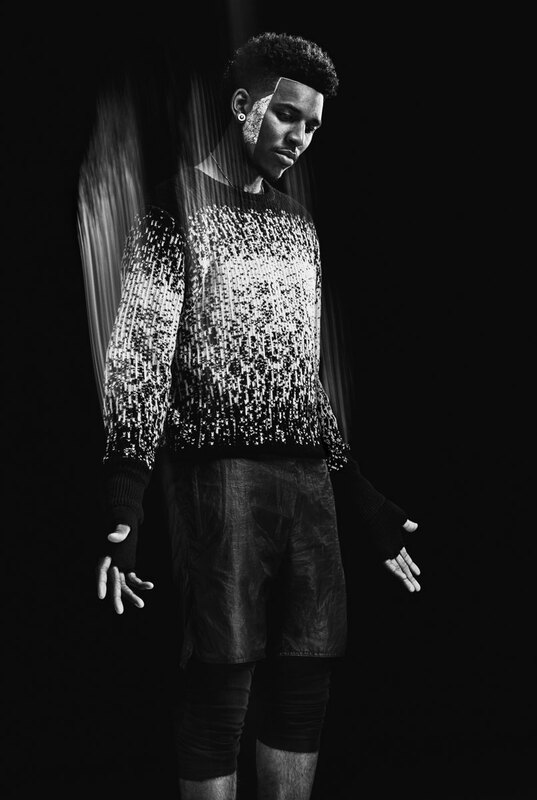 Jacquard cashmere sweater and voile lambskin and silk shorts by Bottega Veneta, cotton long johns by Hanro, and unisex acrylic fingerless gloves by American Apparel. Long sleeve pullover with framed seams and Tapered utility shorts by 3.1 Phillip Lim, Brazilian Kyanite rosary necklace by Miracle Icons by Mary Jo Pane, And leather wrap bracelet with brass hook by Giles & Brother. Jersey T-shirt and cotton short sleeve button-down shirt with printed collar and pearl embroidery by Givenchy. Coat by Jil Sander, printed silk shirt by Roberto Cavalli, pyrite micro bead necklace with vintage icons by Miracle Icons by Mary Jo Pane. Poncho, mesh t-shirt with patches, and Sweatpants by Off-White ℅ Virgil Abloh, Slip-on sandals by Nike, Brazilian Kyanite rosary necklace by Miracle Icons byMary Jo Pane, Sterling silver greek cross necklace and braided waxed cotton and brass keyring bracelet by Giles & Brother, and braided leather ‘My Colors’ bracelet by Tod’s. Long sleeve pullover with framed seams by 3.1 Phillip Lim, and Brazilian Kyanite rosary necklace with vintage icons by Miracle Icons by Mary Jo Pane. Polyamide all over print parka with detachable hood and cuffed double face cotton and wool dress trousers by Tim Coppens, faceted Tibetan agate bracelet with vintage icons by Miracle Icons by Mary Jo Pane, Braided waxed cotton lacing lash bracelet with brass hook and nuts and braided waxed cotton and brass keyring bracelet by Giles & Brother, and braided leather ‘My Colors’ bracelet by Tod’s. Mesh t-shirt with patches by Off-White c/o Virgil Abloh, Brazilian Kyanite rosary necklace with vintage icons by Miracle Icons by Mary Jo Pane, and sterling silver open greek cross pendant and ball chain, by Giles & Brother. Coat by Jil Sander, printed silk shirt and pants by Roberto Cavalli, slip-on sandals by Nike, pyrite micro bead necklace with vintage icons and faceted Tibetan agate bracelet with vintage icons by Miracle Icons by Mary Jo Pane, braided waxed cotton lacing lash bracelet with brass hook and nuts and braided waxed cotton and brass keyring bracelet by Giles & Brother, and braided leather ‘My Colors’ bracelet by Tod’s. 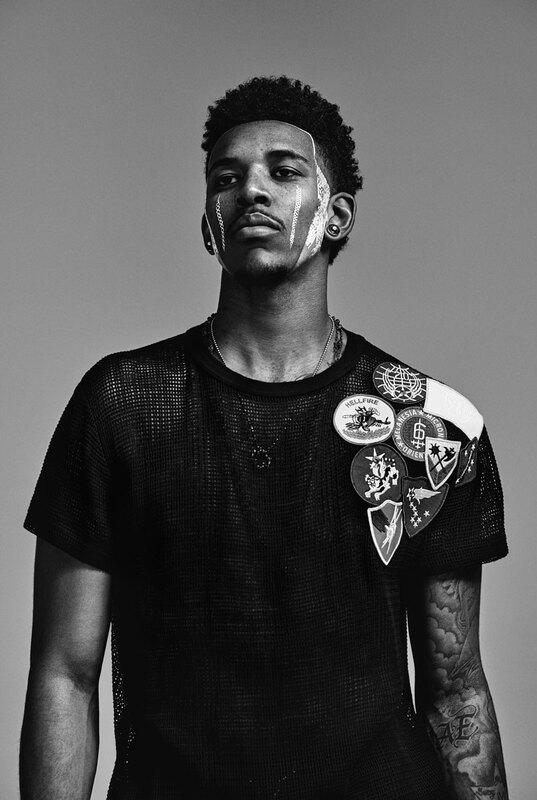 Nick Young plays basketball for the L.A. Lakers; his girl is Iggy Azalea; he is the foremost style icon of the NBA, [apologies to other previous coverboys of this mag]. But what truly sets him apart from these résumé notes is his wit and personality, his confidence in the game, and the playfulness with which he conducts himself. His is an affable charisma, a man whose wit exceeds many, but who really wants to both play to our level, and to elevate the game. Nick Young grew up in a rough L.A.—his brother was murdered by a gang that would later populate the high school where he revealed the first flickerings of basketball stardom. Yet it was that gritty—occasionally tragic—Los Angeles milieu that produced “Swaggy P” Nick Young’s nickname—a sobriquet akin to what the Italians call sprezzatura—the ability to produce extraordinary feats of wit, skill, and style with an air of indifference and relaxed enjoyment. Stylist Jenny Ricker says: “he has an incredible sense of personal style; that and his manners really set him apart.” This is Young’s strong point, and he might know it. 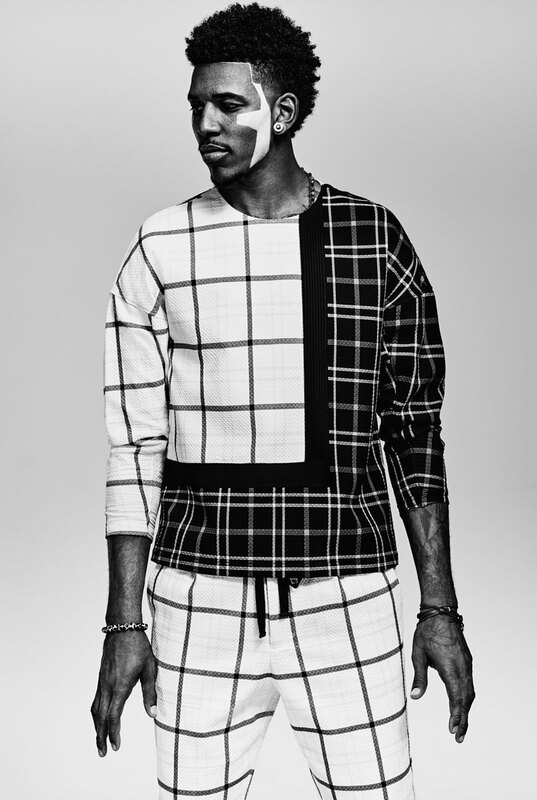 The man says he doesn’t compete with Kanye, rather “when I’m hangin’ with Kanye, I’m more… picking his brain.” Recently, Young finds himself drawn to brands like Supreme and the Hundreds after a long streak of favoring Saint Laurent, Givenchy, and Balmain, from which he tired because “everyone is doing it.” He expresses respect for Jerry Lorenzo, whose label Fear of God has blown up, partially on the strength of Kanye’s endorsement. But behind these props, one feels a lust for a creative outlet in Swaggy P. He says he’s maybe working on an eponymous fashion label, and one could easily speculate that a man with so much fashion savvy and access would produce a line of significant reach. On the court, he is controversial, but popular, never mind the occasionally dismal shooting stats, when he’s on, the present is all that matters. It is transcendent and graceful, and it never looks hard earned. Even teammate Kobe Bryant—whose manic freakish intensity on and off the court is legendary—seems to enjoy the lighthearted Tao of Nick Young. I’m chatting with Swaggy on a bad phone in a hot Los Angeles. Swaggy’s in a hotel room in a cold boring city that I didn’t even bother registering, eating ribs. Swaggy’s bag man Doug is on the line too. In response to a question regarding the ’90s Tupac film Poetic Justice, Swaggy says that he “gets in trouble with Doug for saying that kind of stuff.” The “kind of stuff” Swaggy is referring to is an unbelievable moment caught by TMZ, and it goes like this: Late one night, Swaggy and Iggy are followed by camera crews leaving 1OAK. Swaggy is clearly a couple of drinks deep, and he gleefully intimates to the camera his plans for Iggy when he and the lady get home. His bawdy, boozy explication is the headline, but the real gold comes a few seconds later. TMZ asks “what do you think about people calling for [then Lakers head coach Mike] D’Antoni’s job?” Swaggy—already sliding into his seat—turns to face the camera and locks into an uncannily Tupac gaze. “Damn, it’s a shame what happened to D’Antoni.” Two weeks later, D’Antoni was forced out. This kind of playful drunken puppet master would be a clever trick by itself, but in fact, it was a perfect reenactment of a scene in Above The Rim where the character played by Tupac says, “It’s a goddamn shame what happened to Flip,” and subsequently murders him. It’s a genius play, a move that could only be punished in a realm as repressive as L.A. basketball, wherein the most oft-quoted man is terminal racist weirdo and ex-Clippers owner Donald Sterling. Later, our conversation turns to Iggy. I ask if he’s going to marry her. He laughs, turns a bit more serious and then says that he has a “12 step program” and also that “she’s doing pretty good”. When pressed on details of the 12 steps, Swaggy seems mindful of Doug in the background, and clams up in the most ingratiating way possible. I manage to squeeze just three of the supposed “12 steps” out of him: 1.) She cooks for him. I ask what, and when he replies that she made a mean pork chop sandwich; I begin to suspect that Swaggy’s not the toughest grader. 2.) When the bedroom got messy and he got annoyed, he would go to practice and come back to a clean house. Number 3 gets lost in a wave of reluctance and regret for agreeing to talk about it in the first place. One thing is clear though; the man might be laid back, but don’t mistake that as a flaky lack of commitment. Nick Young means business. Photographer: Carlos Serrao for BeautyandPhoto.com. Stylist: Sean Knight for Jedroot.com. Makeup: William Lemon III for BridgeArtists.com using temptu. Photography Assistants: Ron Loepp, Roger Pittard, Jamie Jacobson, and Amy Mauth. Digital Tech: Damon Loble at DamonLoblePhotography.com. Location: Mack Sennett Studios at MackSennettStudios.net, Los Angeles.